In an effort to help bring fresh produce to more Snohomish County homes, the Snohomish County WA State Farmers Market Lead and WSU Extension SNAP-Ed presented at a Snohomish County Food Bank Coalition Meeting in Spring 2018. The presentation included background on the Farmers Market EBT Match Program and how to use EBT at the farmers markets. The presentation was intended to raise awareness about the match program, provide sufficient information so food bank directors could share market info with staff, volunteers and customers and to answer questions and hear feedback about the farmers market match program. Following the presentation at the coalition meeting, WSU Extension SNAP-Ed followed up with individual food bank directors and provided information to food bank customers in Snohomish County during cooking demonstrations and at a special food bank farmers market ‘promo’ event. 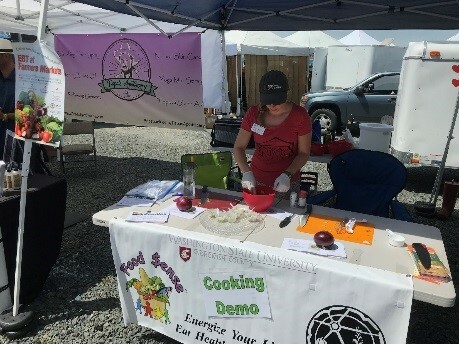 WSU Extension also provided cooking demonstrations and recipe sampling at the Everett Farmers Market each month during the summer. 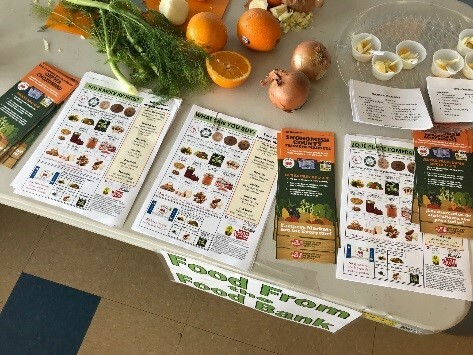 These local food bank outreach efforts resulted in over 7,500 Snohomish County residents receiving healthy recipes and information on using EBT benefits at farmers markets.